Create a promotional flyer of your choose! It can be for an event, product, or anything. It can be crazy and colorful or simply and clean. I feel so much pressure with finals, it’s ridiculous. So, here’s a quickie tutorial on how I designed my promotional flyer for my final project, Long Awaiting. Okay so in high school I did this project for a yard sale that the school was doing so for the promotional flyer assignment I picked up that old file, dusted it off, spruced up the font choices and here we are. This design assignment was something I used to do on a weekly basis. I just did not want to over do it on the graphics. I also wanted it to look simple, like someone with some knowledge of publications did the flyer. My second created assignment is Promotional Flyer. 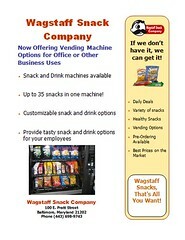 Wagstaff Snack Company is happy to announce the availability for vending machines. Wagstaff snacks will now be available for offices and other business use.